Strong sunshine over the mountain - we were really relieved to see it after two days of rain. 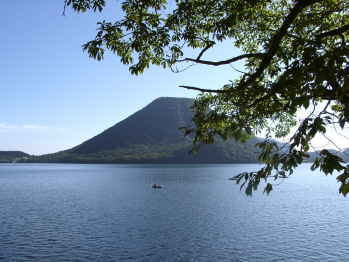 Today the Haruna-Fuji, the volcanic mountain, looks less mythical than yesterday, but it is nonetheless impressive. We saw a photo of the frozen lake, where ice skates can be enjoyed. This must be a great experience! We have a heavy traveling before us today again, but we will not bore you with it. Instead, we report you the experiences from yesterday. Here you see the entrance of the hotel bath (separated strictly by gender!). 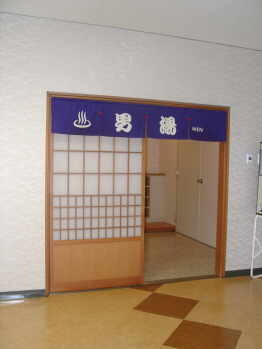 Since the beginning of our trip, we have been trying to secretly photograph the typical Japanese bath from inside, but till now no success. Whenever it seemed we were alone, the door opened and bath-ready-looking men came in (not that they looked dirty, simply ready to enjoy the relaxation in a bath). Between the dinner and the ëbedtimeí we renewed our devotion to take the picture in the bath again!. No shoes were found at the entrance of the bath - it looked promising. No one in the bath, finally we were alone. 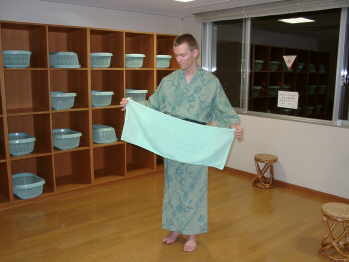 You take off your Yukata (summer Kimonos) in a room before you go in the bath. The bath towel looks rather big in the photo, but it is actually little larger than two sheets of paper and as thin as a papertowel. Then quick in the bath. 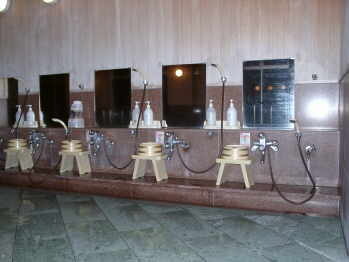 At a wall, there were neatly placed tools to help you take your bath. Now on your marks and start washing! But caution: not to jump into the bath with any soap left on your body! Shampoo und soaps are sponsored by the hotel, but which is which anyway? One press on the button and the bath bowl is filled with just the right amount of water. Now with a correct swing, you lift the bath bowl over the head and empty it - so you wash off the soap on your body. As you can see, weíve already got a hang of it. 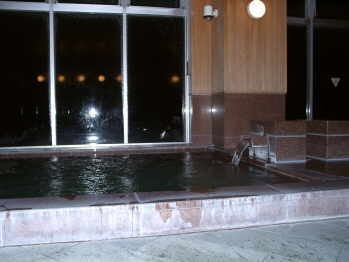 Only after this ëritual washingí, you may finally enter the hot bath (between 40 and 45 degrees celsius). As most of the hotel rooms (hotels of our price range) do not have a shower, we have gotten used to going to bath before bed time - it is a great way to relax and to achieve the right sleep mode. In the hotels, the staffs are, sadly enough, familiar with the bad manners of foreigners in the bath. So they kept reminding us to shower before going into the hot bath tub again and again. After 6 hours of travelling, we decided to devote the afternoon for a pure cultural experience in Nikko. As a start we walked up the steps of Rin-no-ji Tempel. 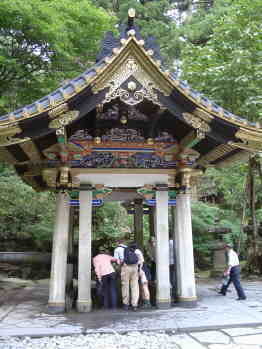 Before entering the temple, you cleanse your hands with this spring water. At the temple entrance we got directions right away: no shoes, knee down and no photos. After a monch directed us to sit down on our knees among herds of Japanese visitors he started to (supposedly) explain about the building that contains gold all over. We could not understand any word of the original explanation, but we could tell from the Oh`s and Ah`s of other visitors that the explanation held extraordinary stories. In the much longer second part of the explanation, the monch started to show various ëseem-to-be-preciousí objects and handed them out to visiters to take a look. Only after we were exiting the temple, we realized that all these objects were sold in the temple shops at outrageous prices and that we were simply tricked in the monchís informercial sessions. 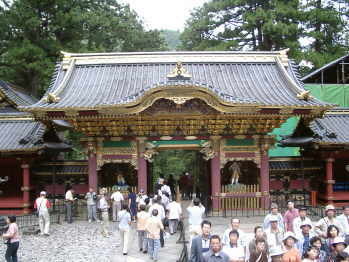 Our next stop was the most famous shrine in Nikko, the Toshogu-Shrine. 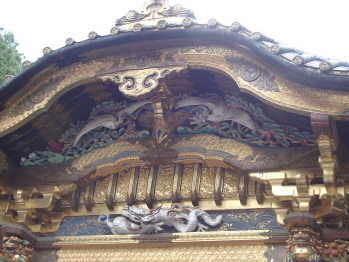 The 22 buildings were built by around 15.000 carpenters from all over Japan. 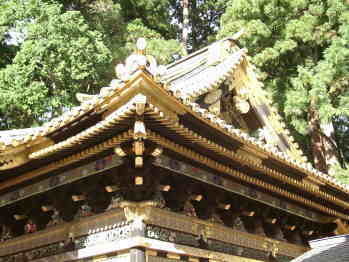 What makes this shrine so special is the amount of Gold that was used and its interesting contrast to the black wood. Many visitors went by one of the points of interest without noticing. 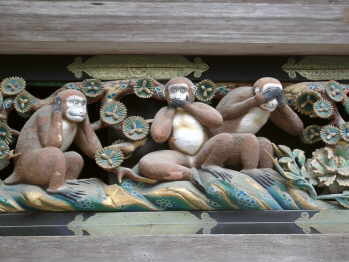 It is a stable for the holy horses and the famous carvings of thress monkeys expressing the teaching of satisfying life ënot listening, not telling and not seeing of negative things`. As you can see we did not miss this cultural delicacy. 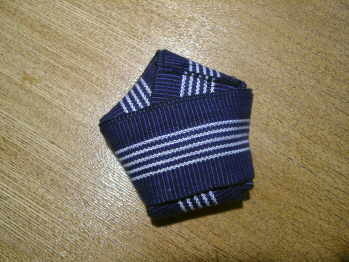 5) What is the object on the photo ?